During the early 1930s, outlaws rampaged across much of America, seemingly robbing banks and kidnapping at will. 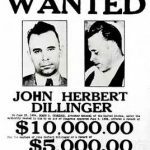 Some of the more famous of these outlaws were Baby Face Nelson, Pretty Boy Floyd, Bonnie Parker and Clyde Barrow, and Alvin Karpis and the Barkers, but John Dillinger was undoubtedly the star. A wave of celebrity kidnappings and the murder of four law enforcement officers in Kansas City in June 1933 during a botched attempt to rescue a veteran bank robber made it clear that a national police force was required, especially since local police were forbidden to cross state lines. The Federal Bureau of Investigation (FBI) was an obvious candidate for this national police force but it had to pass through a steep learning curve since it was under-funded and its agents were not originally allowed to carry guns. The Public Enemies Era lasted from 1933 to 1935, although Karpis, the last holdout, evaded capture until 1936. After five FBI agents are killed in the Kansas City Massacre, an infuriated FBI Director J. Edgar Hoover assigns Special Agent Melvin Purvis to hunt down Dillinger, Nelson, Floyd, Machine Gun Kelly, Wilbur Underhill and Handsome Jack Klutus. This is a personal matter for Purvis, since he was friends with one of the agents killed in Kansas and he intends to smoke a cigar over each outlaw’s dead body. One by one, the outlaws are tracked down by the FBI but Dillinger continues to elude Purvis. When he is finally captured, he manages to escape from prison, which leads to a massive manhunt. The gang reunites at Little Bohemia, where they are joined by Pretty Boy Floyd and Baby Face Nelson. Unfortunately, the FBI discovers their location and most of the outlaws are forced to flee. Dillinger hopes to disappear but his fame makes it impossible. Actually, only one of the five men killed in Kansas City was an FBI agent; the remaining four men were an Oklahoma police chief, two Kansas City policemen and the bank robber they were guarding. Oddly enough, Verne Miller, the main suspect in the massacre, does not have a role in the movie. It seems as if every outlaw movie has a member of the gang who is prone to panic and Eddie the driver is that character in this movie. While it may be a tradition in movies, the big name gangs generally refused to work with people who could not stand the pressure because it was an unnecessary risk. Professional bank robbers like Dillinger used carefully prepared maps of escape routes and took hostages to ensure that the local police did not pursue too closely, none of which appears in the film. Most important, despite the admittedly enjoyable opening scene, they did not introduce themselves during robberies because they realized that identifying yourself while committing a crime pretty much guaranteed that you would end up in jail, which most of them thought was a bad idea. Although FBI agents manage to surround each criminal without being seen, Purvis does the actual shooting. The rest of the FBI seems to exist to light Purvis’ cigar and hand him his guns, but the real Purvis had such a poor record that he was replaced as head of the FBI’s Chicago office by senior agent Samuel Cowley. Furthermore, the FBI’s track record during the early stages of the Public Enemy era was nothing to be proud of. The inexperienced agents made mistake after mistake, and saw the outlaws slip through their fingers far too often. In fact, Hoover resisted becoming involved with the hunt for Dillinger because he knew that his agents were already spread thin. Worse, the movie ignores the contributions of local law enforcement officials. Bonnie and Clyde were hunted down and killed by Dallas police led by an ex-Texan Ranger, Pretty Boy Floyd was found by a local sheriff, and an undercover Fort Worth detective played a key role in the eventual arrest of Machine Gun Kelly. A number of important details are left out. There is no mention of the lawyer who served as Dillinger’s intermediary with other outlaws or the fact that he wanted to be held in Crown Point rather than the much more secure Michigan State Prison. The story of Dillinger’s breakout from the jail is justly famous, although the details are hotly debated. While the movie chooses to follow the most romantic version, it is definitely an exciting scene. Floyd’s involvement in the gang is unlikely, although he and his partner Adam Richetti may have taken part in one robbery. Dillinger and Nelson did work together but the idea that Dillinger beat Nelson silly in front of the rest of the gang is simply laughable. The real Dillinger joined Nelson’s gang because most of his former partners were behind bars and he needed money to pay his legal bills. Furthermore, everyone was afraid of Nelson because he was basically crazy. They would surround him as he counted out each person’s share after a robbery to ensure that he did not kill them all and keep the money. 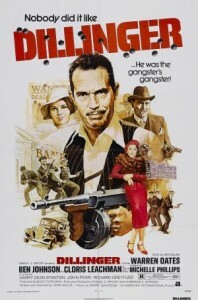 Dillinger’s habit of shooting up bars, robbing everyone and shouting his name at every possible opportunity is clearly designed to ensure that he does not win the audience’s sympathy. While I am no fan of glorifying murderers, Dillinger became a national celebrity largely because of his charm, and he was well-aware of the value of his media image. The movie recognizes this when it shows that Dillinger is tempted to disappear into Mexico with his loot but is unable to give up the fame. It is an enjoyable film with a great group of character actors that gets most of the general facts right. However, the deaths of the other outlaws receive little screen time and the order of their deaths is changed to fit the plot of the movie. The climatic shootout that destroyed the gang took place at night, not during the daytime, and the outlaws simply slipped away while the inexperienced agents shivered in the darkness while waiting for reinforcements, although it is understandable that director John Milius wanted to spice up the movie with some gun battles. The rather abrupt end of the movie suggests that the budget ran out, and unfortunately there is no mention of the plastic surgery that enabled Dillinger to move around in public and go to nightclubs. While the time-honored super-agent approach may have given Ben Johnson a great character to play, it was a disservice to the many FBI agents who performed a risky and frequently fatal job for little reward. The favorable treatment of Purvis would make one think that the movie met with the approval of the FBI but FBI director Hoover had greatly resented the publicity that Purvis had received following the destruction of the outlaws and nursed a lifelong grudge against him. If you keep watching through the credits, you will hear a disclaimer recorded by Hoover shortly before he died.